After reading the excellent KISS ALIVE FOREVER, we contacted the publisher for a possible interview with one of the authors. Co-author Curt Gooch granted us this interview, in which we talked about what goes in to making a rock ‘n roll reference book. Curt Gooch was executive producer and creative consultant on the documentary/home video “Inside The Casbah: A History of Casablanca Records and Filmworks”. He currently writes for The Original Entertainer. In addition to his work as an entertainment photographer, he previously acted as video and still photography consultant for the KISS Trivia Challenge. E.C. : First tell me about the origins of KISS ALIVE FOREVER and how the book came about? Curt: My co-author Jeff Suhs and myself had both been working on putting together a complete list of the KISS performances for years. This was before we knew each other, and before anyone else was attempting such a project. We met in early 1996 and worked virtually full time on it for the next six years, until the book was published late last year. E.C. : How did you and Jeff Suhs divide up the writing of the book? I mean, did one write the history and the other compile the interviews? Curt: I would usually write an outline for each chapter and then Jeff would expand that into text. Then we'd both go in and do rewrites and re-sequence the text as necessary. It took us an entire year to physically write the book, because so often you'd need to go back and do research on someone's quote to make sure it was 100% accurate. We wanted the book to be virtually error-free, which is an incredibly ridiculous goal when you're dealing with thousands of facts and figures. E.C. : I read where the book took over 7 years. Were you surprised by how long the book took to complete? Curt: Initially, we thought it would take only a year and a half to complete, but some of the "black holes" in KISS's history were pretty black. E.C. : Where did you come across such cool photos? Curt: We went to nearly every photo agency in the world and then wound up only using about 10 images from two agencies because a vast majority of their images were just too common. Fans, ex-roadies, friends and even former groupies all contributed photos, which I think gives the book a more personal feeling. Overall, I probably looked at about 10,000 photos, which we narrowed down to just under 200 for the book. E.C. : I imagine that you must have a helluva live video/CD collection by now! How integral were the study of these to your book? You can almost write a second book, "Guide to KISS Concert Recordings"! Curt: The best way that I can think of to research a concert is by checking out a tape of the show. Even if I attended the show, and have notes on it, I'd still rather sit down with an unedited tape and go over it because a tape doesn't misremember or forget to write down a song. I'd say these recordings were quite integral to our book as it gives one the ability to archive a small piece of history that would otherwise be lost forever. And I think KISS Alive Forever could be, if one wanted to perceive it that way, a guide to KISS concert recordings, since all known recordings are listed within it. Curt: I think Alive! has rather minimal overdubbing, I don't think it's quite as much as Eddie Kramer makes it out to be. Alive II (for the most part) and Alive III sound completely like they were recreated. E.C. : Again, speaking of Gene's "revisionalist history" of KISS, your book sets the record straight about the true origins of the solo albums. Why do you think Gene glosses over some of these major facts in his telling of the KISS story? Curt: Gene and Paul are into speaking in quick little five-second soundbites and I think they tell that story just because it's convenient for the mass public who won't know any better or care. 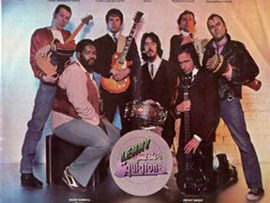 Right: The 1979 picture of Peter Criss (seated at drums), sans make-up, on the Lenny and the Squigtones Casablanca record. E.C. : I also enjoyed the trivia in your book. Like the story about Peter Criss being photographed without makeup for the "Lenny and the Squigtones" album in 1979-also released on Casablanca Records. [I've attached a photo from the insert of the album] Is this the photo in question? Curt: Research is how any conflicts we came across were resolved. We were extremely cautious of conflicts because some of the other KISS books just have way too many instances of that, or even worse, information that is just flat-out incorrect. If you believe everything you read in some of the other KISS books, you'd come away thinking that Randy Rhoads rose from the grave to audition for the lead guitarist slot when Ace left, and he still didn't get the job! That's really poor research. E.C. : More Gene bashing…ha ha, next I'll ask what would have become of Van Halen if Gene HAD managed them…in your estimation? Back to the subject at hand, Gene is a notorious control-freak when it comes to anything KISS related. Did he ever try and stop your book? Has there been any input/reaction from the KISS members about your book? Curt: Van Halen and Cinderella are just about the only entities to escape what I call the KISS Curse. If Gene had managed them they would've went down faster than you can say Simmons Records. But to answer your question, yes, Gene made a few threats and a few calls but nothing happened because Gene's powerless against the first amendment; plus in the end he knows that KISS Alive Forever helps him much more than it hurts him. He's got a copy of the book in his house, so I'm sure he's read it and I'm sure he loves the fact that someone went to that much trouble over KISS. E.C. : I loved the little humorous tales about the shows, my favorite being the show where Peter was all set to sing "Beth" and the Beatles "Magical Mystery Tour" comes blaring out of the speakers instead! Will more of these anecdotes be in your next KISS book? Curt: Yes, except they won't be anecdotes so much as they will be full-blown stories. The book should be out by next spring. E.C. : Speaking of which, tell me about your next KISS book? I understand that the tentative title is "KISS:Out On the Streets"? Will it be a history of KISS? Will there be more unpublished photos? When will it be released? Curt: The book should come out in late April of 2004 and it will be like KISS Alive Forever except more in story form and without all of the stats. We'd like to get double the amount of photos in the next book, and the really cool thing is they will all be from 1973-76. It will be a very open and honest look at the early years of KISS from their first road crew's eyes. We will also be doing a video version of the book with some of the early unreleased KISS footage we have dug up. E.C. : Have you considered writing books similar to KISS ALIVE FOREVER about other rock 'n roll bands? What about other book projects, such as bios about other bands? Curt: Yes, we have and we will because they are so much fun, but right now I'm just dying to write a screenplay or two once the next KISS book is done. E.C. : I find it ironic that although KISS did a "farewell" tour, they have announced more shows (just like The Who and Cher) with Aerosmith. How long do you think they will continue to play live? Curt: KISS will continue until as long as money is still being printed.